Josie McIntyre (front) celebrates with her family. For many spectators and sports enthusiasts, the 15th staging of the Special Olympics in Abu Dhabi last month might have been just another stellar addition to the myriad of star-studded and big-name sporting events packed into the sizable UAE sporting calendar. But for many competitors and their families, the impact and benefits will go far beyond the initial buzz generated from the week-long event. 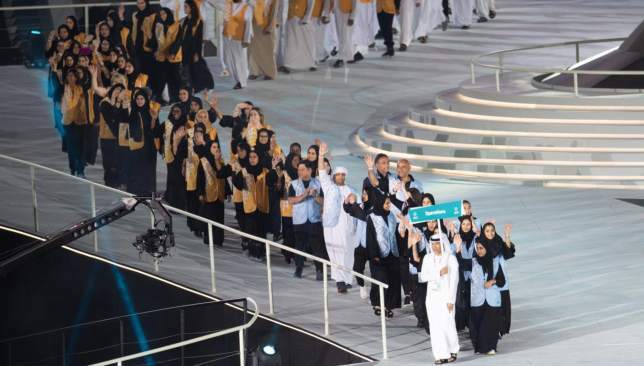 The 2019 Special Olympics World Summer Games was held in the UAE capital from March 14-21. It was the first Special Olympics to take place in the Middle East and the largest sports and humanitarian event recorded, featuring 200 nations, more than 7,000 athletes and 20,000 registered volunteers. And while the attention and fanfare may have died down as we move on to the next big event to be staged here, for teenager Josie McIntyre and her family, it will have a lasting impact and lead to many more doors opening up. Sports-mad Josie was part of the UAE squad at the games. The 13-year-old daredevil loves gymnastics, dance, swimming, sailing and even surfing, and earned two medals during the week, taking home silvers in rhythmic gymnastics and dance sport in her age categories. And while the entire McIntyre family are thrilled with her double success, what they’re even more excited about is what the future holds for Josie. Josie won two silver medals. 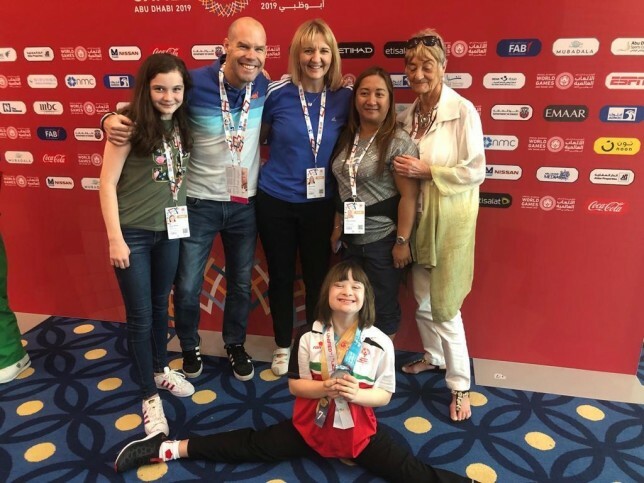 “The gymnastics and Special Olympics has opened up our eyes into what can be possible for her in the future, which we want to make as broad as possible,” said dad Rick McIntyre. Wellington Academy Silicon Oasis pupil Josie was born here in the UAE in 2006 to New Zealand father, Rick, and Welsh mother, Clare, who have lived in the Emirates since 2003. Josie has spent the last seven years at Wellington Academy but moved to the Dubai Centre for Special Needs in 2018 – their smaller class sizes cater for her needs beautifully, says Rick. “She loves school but nothing more than PE – easily her favorite subject,” he added. “She has always been uber-flexible so we started taking her to gym a year ago. Fit Republic in Sports City gave her and some of her gym buddies the chance to train for the Special Olympics and represent the UAE in gymnastics. The Special Olympics movement was started by Eunice Kennedy Shriver – sister to former President of the United States, John F Kennedy – half a century ago. The first two games were held in Chicago – the inaugural event in 1968, before moving outside the US for the first time in 2003 when Ireland were the hosts. It has since been held in China, Greece and Germany but coming to the UAE, and the Middle East in general, was a challenge. 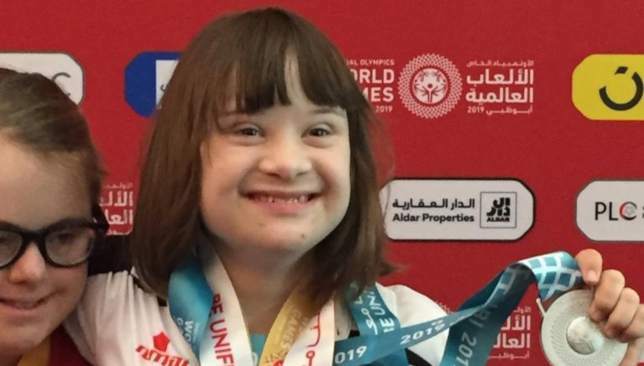 But Rick insists the UAE has embraced the event and athletes with special needs, or ‘people of determination’ as they became known in the lead-up to and during the Special Olympics World Summer Games. “The Special Olympics was incredibly special and there’s lots of opportunities to explore,” he added. “The UAE gives us lots of opportunities. Inclusion is on the national agenda and Josie’s reaping the benefits. We’re fortunate that it’s 2019 and not 2000 I guess. The country has made incredible progress and we’re privileged. “We’re grateful to the rulers of the UAE for valuing people of determination, it’s a really positive way of looking at and valuing people with special needs. It’s changed attitudes and opened up opportunities for kids and people with determination. “Josie was highly valued and the Special Olympics gave her a platform where she was super proud and able to display her gymnastics skills alongside her ability to woo a crowd and the judges. Josie quickly became famous for high-fiving all the judges after each event. “We’re still in awe of what happened last month. The rate of change over the last few years has been immense when it comes to inclusion. Josie is part of this national agenda and we actually feel it. It’s tangible. A new sporting academy in Dubai is bringing together athletes and Olympians in a bid to inspire the next generation of track and field stars. East Sports Management (ESM) and Athletes in Schools have partnered to create ESM Athletics, which will deliver elite-level coaching to track and field students aged between 5-18. 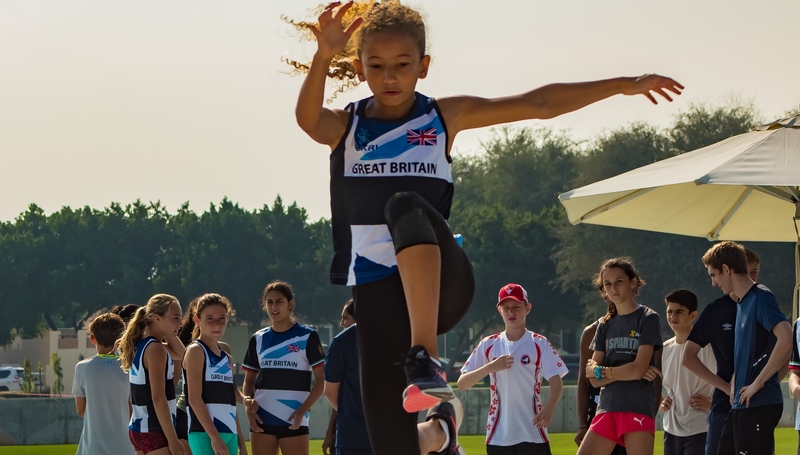 The partnership allows UAE students in participating schools have the unique opportunity to train alongside British Olympic, Paralympic and Team GB athletes. To kick-start the new athletics offering, Team GB Sprinter and former European 200m Champion, Tommy Ramadan, and UK Athletics accredited track and field coach, Ben Davies, touched down in Dubai earlier this month with more professional athletes scheduled to arrive in February. Specially designed training programs based around a run, jump and throw concept give students the chance to discover and develop their skills, as well as building on their speed, strength and stamina. The curriculum includes workshops focusing on events including long jump, high jump, block start practice, javelin throwing, hurdles and endurance challenges. Fast paced sessions run by the experts last for up to an hour, and are designed to be fun and inspiring. Project Director for ESM Athletics, Umar Hameed, said the partnership resulted in an academy that is the first of its kind in the UAE: “ESM Athletics is dedicated to creating a performance pathway for aspiring world class athletes. Together we are using our worldwide network of coaches, athletes and support staff to bring the very best practitioners to Dubai. The first step on this pathway is our commitment to building strong school athletics programmes,” Mr. Hameed said. In addition to the schools athletics programme, ESM Athletics employs British Athletics coaches specialising in youth development and assisting students in transitioning from junior to senior levels. They work closely with UAE schools and create education resources to up-skill PE teachers. ESM was established in 2004 with the aim of bringing high quality sports coaching to the youth of the Middle East at premium sports facilities. Today, it’s the UAE’s leading sports services provider for youth, delivering coaching to over 10,000 children every week in more than 200 facilities. Athletes In Schools is the UK’s leading provider of Olympic, Paralympic, and Team GB athlete school visits, teaming with more than 150 British athletes to inspire students at 400+ schools a year. In 2018, Athletes In Schools successfully launched in the UAE and quickly became the nation’s leading provider of elite-level athletics coaching for schools. ESM Athletics will hold their sessions at state-of-the-art facilities at GEMS International School, GEMS World Academy and GEMS Wellington Academy, Silicon Oasis. To know more about academy sessions, timings and workshops, contact ESM Athletics at [email protected] or call 04-3697817. Four-time Olympic gold medallist Sir Mo Farah has declared he would “love to be part” of a future Dubai Marathon. Sir Mo, 35, is the most successful British track athlete in modern Olympic Games history thanks to his 5,000 metre and 10,000m doubles from the 2012 and 2016 Games. Attention, however, since 2017 has switched to the road, with a maiden marathon win coming in only his third race at Chicago last month. The Dubai Marathon has become a staple on the sporting calendar since 2000’s inaugural event. Speaking to Sport360 on Saturday at a Dubai Fitness Challenge event on The Palm, Farah expressed a desire to join a list of luminaries which includes Ethiopia icon Haile Gebrselassie. He said: “If Dubai invites me, I’d love to do it here. Obviously, it just depends, innit. “There is always different times of year. I love this country and that is what brings us here. “To connect with people here and to be part of the Dubai Fitness Challenge. The milestone 20th running of the Dubai event is set to take place in front of Madinat Jumeirah on January 25, 2019. More than 30,000 runners are set to take part in the world’s richest road race, with a winner’s prize of $200,000. This year’s was won by Ethiopia’s Mosinet Geremew in a time of two hours and four minutes. 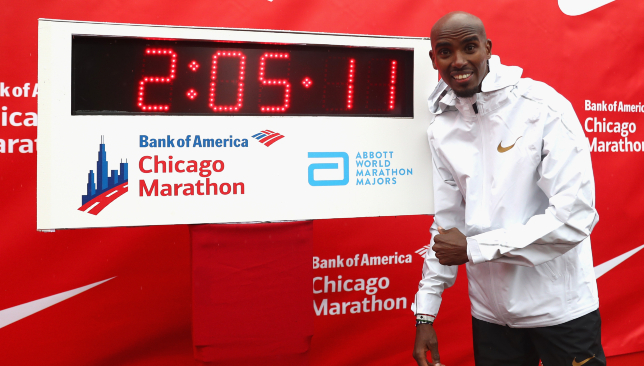 Farah has previously stated his next marathon will come in the spring. London or Boston are the favourites. This weekend, Farah took part in a run around Palm Jumeirah Fitness Village and was on hand to offer expert advice. He said: “It is nice to be in Dubai, for once. I’m chilling out, living the dream and enjoying time with my family – my wife and kids are here. “It is nice to show people what’s possible. It’s nice to be part of Dubai Fitness Challenge. “I love the city, it is doing amazing at encouraging people to stay active and stay strong. It’s got everything you need. The Dubai Fitness Challenge is set to run until November 24. It’s aim is to get people doing 30 minutes of exercise for 30 days.